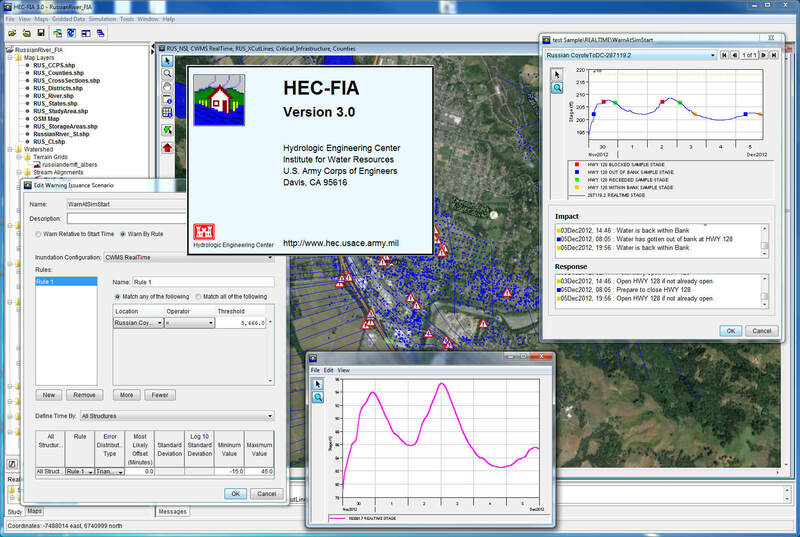 The Hydrologic Engineering Center Flood Impact Analysis (HEC-FIA) software, Version 3.0 (provisional), is a tool for quantifying the consequences of flood events. New enhancements to HEC-FIA Version 3.0 include evaluation of indirect economic losses from catastrophic flood events and incorporation of uncertainty into consequences computations. For more detail on the new features of HEC-FIA Version 3.0 please visit the HEC-FIA Version 3.0 Features page. The HEC-FIA software, User’s Manual on general applications, and sample workshops are available via this webpage. Also, please feel free to download the software, ask for assistance, suggest improvements, and report bugs via this webpage. The diverse experiences of modelers provides far more insights into the application of the software than the software developers can realize on their own, so both positive and negative feedback and suggestions are welcome. Direct technical support by HEC is limited to USACE staff members and organizations with a support agreement. Please review our Support Policy page for details.